With a beautiful garden chapel and complimenting reception thatch, this venue in Midrand will give you a nice romantic country feel to your wedding, even though you are close to all your major routes. From state of the art plated menus or three course buffet meals, we would make your wedding day remembered forever. The surrounding trees and gardens also make for nice pictures that can be kept forever. Our 250m² thatch can host up to 140 guests banquet style seating and we have a separate area for the food if buffet style is required. Complimentary with the venue hire is the option of our boma area that can seat up to 30 guests to give your function a South African feeling to it. This designated area can also be used for a delegated smoking section. 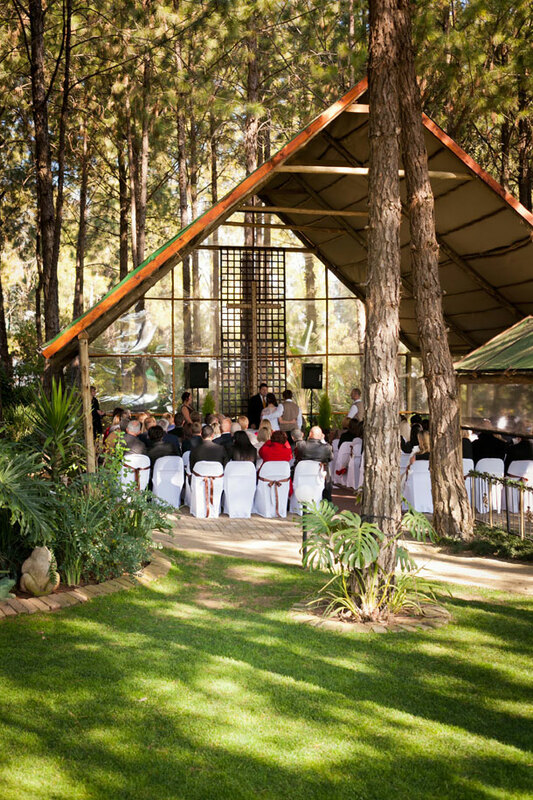 For those looking at a Joburg wedding venue, we have a complimentary garden wedding chapel with basic white draping, to give you a nice romantic ceremony in the forest. We have a wide selection of menus to choose from for your function. From plated menus to buffet menus, we can meet your needs. We also cater for informal events with spitbraai and braai menus. We can also tailor make menus according to your needs. To book this gorgeous venue visit The Forest Walk Venue.